With just a few weeks to go until the annual Nigeria Com 2018 event opens its doors, Connecting Africa is speaking to some of the key figures shaping Nigeria's telecoms and technology sectors. We spoke exclusively with Olusola Teniola, President of ATCON (Association of Telecommunications Companies of Nigeria), about collaboration in the Nigerian communications services market and addressing current connectivity challenges. Connecting Africa: ATCON brings together companies across the telecoms sector in Nigeria. Why is collaboration in this way so important to the industry? Olusola Teniola: ATCON is now 25 years old and was originally formed by a small group of experts in 1993 to address common issues that were topical at that time. Collaboration amongst our members is fundamental to our success and drives the issues that are relevant today. With US$70 billion invested to date in this industry since 2001, it is essential that this collaboration is further strengthened to protect these investments. CA: What is one particular technology or development in telecoms people should be keeping an eye on at the moment? OT: Active sharing -- both in terms of national roaming at the RAN level, and [in terms of] optical fiber networks -- are particular near-term themes that the Nigerian telco industry needs to closely address. Alongside these themes are the adoption of analytics, big data and AI to drive new revenue and digitalise telcos' business models. CA: What do you consider to be the most pervasive challenge to connectivity across Nigeria and where do you think the solutions to this challenge could lie? OT: The input costs associated with covering this vast country of an estimated 180 million people are a challenge to any single operator. Firstly, poor infrastructure in rural areas in the hinterland makes it almost impossible to justify a business case that supports any solo deployments, and secondly, digital literacy is very low. Government interventions to address these input costs are being explored and community-based networks may serve as alternatives to the dependencies on current providers reaching these areas. CA: What excites you most about working in the African telecoms sector? OT: Personally, I have had the opportunity to work in the UK, Europe and US during my career and nothing compares to the sheer challenge of working in an emerging market like Africa. There is never a dull moment and one's impact is felt more in Africa than elsewhere. CA: What is your key message at Nigeria Com this year? OT: My key message for Nigeria Com would be to increase collaboration that seeks to push forward an increased penetration of 3G, 4G and fiber networks to increase our broadband penetration beyond 21%. 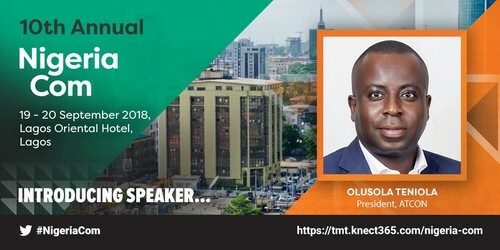 Join Olusola Teniola at Nigeria Com 2018, where he will be joining our panel discussion on 'Strengthening urban connectivity for fast, consistent broadband access.' Learn more about the event.